Own this amazing piece based on the original line image hand drawn and hand-inked on paper by Mr. Comes with Original Certificate of Authenticity. Professionally mounted and framed in a black frame. The overall size is approx 21x19 inches. Please contact me if you would like any more info about this item. Chuck Jones was born in 1912 in Spokane, Washington. He was raised in Hollywood where he witnessed the talents of Charlie Chaplin and Buster Keaton. As a child he occasionally worked as an extra in Mac Sennett comedies. Jones graduated from Chouinard Art Institute in Los Angeles (now California Institute of the Arts). In 1932, Jones got his first job as a cel washer for Ubbe Iwerks, a former Disney Animator. After being hired by Friz Freleng as an animator. After Warner Bros closed Jones briefly worked for Disney before moving to MGM where he worked to create new episodes of Tom and Jerry and directed features such as The Dot and the Line, which went on to win an Academy Award for Animated Short Film. Chuck Jones' work has been honored at film festivals and museums throughout the world, including a one-man retrospective at the Museum of Modern Art in New York City. His autobiography, Chuck Amuck, appeared in 1989, now in its fifth printing. This item comes complete with our Certificate of Authenticity and Lifetime Guarantee. We are UACC Registered Dealers 204 and AFTAL Approved Dealers 004. About us (Sport and Star Autographs). Sport and Star autographs was the development of a private collection and love of a hobby spanning many years. We opened our first shop in 1998 and have moved to three different locations due to the need for expansion because of our success. We also have a store in London Liverpool street and together through the years we have gradually grown and become one of the most well respected memorabilia and autograph dealers in the country. Our company has been in the public eye on many occasions due to our business partnership with Steve Tilson Southend United manager and the awards that we have picked up over the years including the Basildon District Business awards for Growing Business of the Year and the prestigious Spirit of Ingenuity award. We stock 1000s of Vintage and Modern autographs from the world of Film/TV, Music, Sport and history. Sport and Star Autographs are the founders of AFTAL Autographs Fair Trade Association. AFTAL is run by the UK's best autograph dealers and in person collectors. Our objective is to help to stamp out fake autographs within our industry. For more information please view our About Me page. All our framed items are sent via Business Post on a next day service (from when despatched). 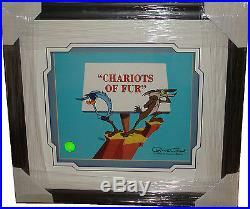 The item "Chuck Jones SIGNED CHARIOTS OF FUR Hand Painted Sericel Limited Edition" is in sale since Friday, July 27, 2012. This item is in the category "Collectables\Animation Collectables\Animation Art\Other Animation Art". The seller is "sport-and-star-autographs-204" and is located in Basildon. This item can be shipped worldwide.